The Mulzacs family luxury suites is Brooklyn's newest vacation rental. This four story building was built specifically for vacation renting. This rental is guaranteed to be the best vacation rental in Brooklyn with more amenities than any other rental. This duplex has three bedrooms and two bathrooms. On one floor of the duplex you have a master bedroom a living room and a computer work area. On the other floor you have 2 bedrooms, 1 bathroom, a large dining room a kitchen and a fabulous roof deck. This is perfect for couples who want their own privacy. Included is 50 HDTV DVD player cable TV, desk, PC, printer and web cam and much more. This suite is conveniently located on Fulton St in Bedford Stuyvesant. All your major shopping and restaurants are right downstairs and NYC is only 10 minutes away via A express. We do provide off the street outdoor parking at no additional cost. Upon arrival we supply complementary , milk,eggs ,bread 9 soda, 4 beer turkey bacon ,pork bacon, butter, cream cheese ,coffee, tea,cereal fruit cups. orange juice, apple juice. 12 bottle Ect. Our family of five enjoyed a chilly spring break in this very comfortable split-level condo in a culturally diverse section of Brooklyn. Subway access (Nostrand/Fulton) is only two blocks away so trips to the city are a snap. The owners were very responsive to our needs and stocked the apartment with grocery items to make our arrival especially pleasant. Note that W/D facilities are not available in this unit. We had a great time and really appreciate the owner's attention to detail. Spacious apartment and well equipped. Property was easy to find and access. Much appreciated the provisions in the fridge for the first night and easy breakfasts. Would also recommend the cafe below the apartment. Used local takeaways a couple of times and the Foodtown supermarket, but didn't have chance to try any local restaurants. Loved the roof terrace, especially for views of Manhattan at night. Great location for using the A and C line subway to get into New York. Also took the B25 bus to the DUMBO district of Brooklyn, well worth a visit. Really enjoyed our 5 night stay. Thank you. Clean apartment and well equipped. The bonus food they supplied was enough to get us through without a trip to the grocery store. The living room furniture and window shades need updating. We had 5 people and one small couch to share in the living room. Other than that, it suited us perfectly and saved us lots of money if we had gotten 3 hotel rooms. Thank you!! We stayed for 10 days in the Mulzac family's rental and really enjoyed our time there. The location is very close to subway so you can be in Manhattan in no time and it's nice to get out of the hustle and bustle at the end of the day. The roof terrace was fabulous. We had everything we needed, even equipment for our 2 year old daughter which was very helpful. Brianna and her dad were very friendly and communicative. Highly recommend. Very nice accommodations. Was very clean and the amenities were much appreciated. Location was perfect for bus and train. Loved the rooftop area and enough living space for the family. Great communication from the host, easy to work with, so everything was smooth. Would definitely stay here again. All five of us thoroughly enjoyed our 4 night stay. The two-story apartment was very clean and all of us felt very comfortable there. 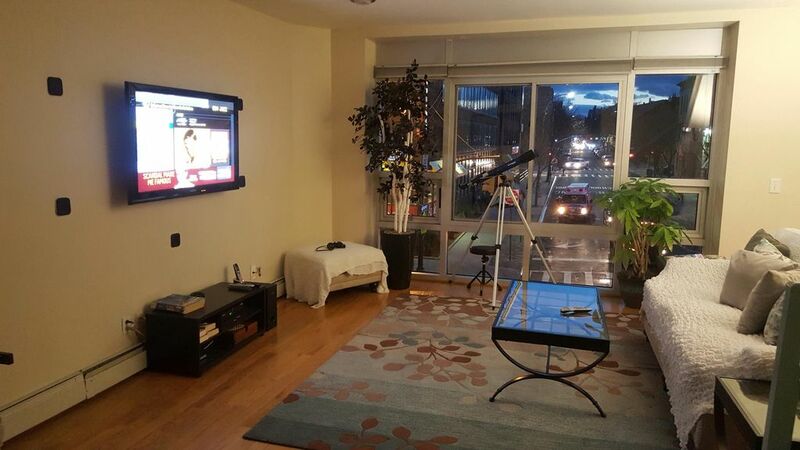 It is spacious and has a great location, just a short subway ride to Brooklyn Heights and Lower Manhattan. The roof-top terrace was a great bonus and provided really amazing views of the Manhattan skyline. There are plenty of great restaurants in the neighborhood and we got to taste the famous Brooklyn pizza. Our hosts were great and very accommodating. I would highly recommend this rental apartment.